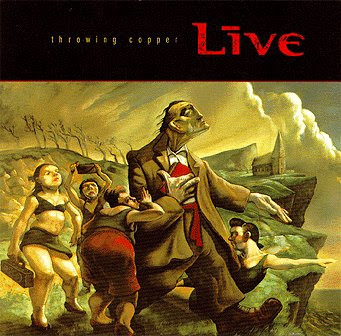 I still remember the day I purchased the Throwing Copper album. My mother was working at a music store in Calgary, and I used to go in with her sometimes for singing lessons. The lessons themselves were only an hour long, but I cherished them (I had a massive crush on my teacher; we mostly did showtunes). During my free time, I would play around with one of the display guitars, or go to Chapters across the parking lot and read. Sometimes I would wander over to the record store. They sold new albums, but primarily they dealt in used CDs and cassette tapes, and often I could find obscure or rare gems within the carefully ordered shelves. I’d been meaning to pick up some Live ever since my grade ten English teacher asked us to write an essay based on the song Lightning Crashes. I wrote about the idea of reincarnation. At the time I really didn’t know much about Eastern religions, but he liked the essay, regardless. More importantly, the song turned me on to the music of Live. At the time I didn’t have a whole lot of my own albums; mostly I borrowed CDs from my parents or my older sister. My collection consisted of: Ace of Base’s The Sign, Dance Mix ’94, No Doubt’s Tragic Kingdom and some Weird Al. Live was the perfect first expansion to a paltry collection. I promptly bought Secret Samadhi after that, and my girlfriend at the time gave me The Distance to Here for my birthday. Nearly everybody from the ’90s is familiar with Live. Similar to Collective Soul, they combine a post-grunge sound with often-spiritual subject matter – Ed Kowalczyk was often inspired by the Indian philosopher Jiddu Krishnamurti. The albums are worth a listen for more than just their mainstream hits. It’s the type of music I keep going back to time and time again…and I always find something new to enjoy in their sound or the lyrics. …and is it just me, or did every slow-tempo alt-rock music video of the ’90s do that weird camera-flash thing?